One of the primary perks of a fully remote job is that you can work from pretty much anywhere. All you need is a laptop and a dependable Internet connection, and you’re good to go. If you’re one of these remote road warriors, and you like the snowy climes of the U.S. Northeast, Vermont has a deal for you. State leaders have decided to try to establish Vermont as a destination for digital nomads, offering cash incentives to convince remote workers to set up shop there. Vermont’s Remote Worker Grant Program officially launched on January 1. According to information from the state Agency of Commerce and Community Development, it offers reimbursement grants of up to $5,000 per year, or $10,000 over two years, for remote workers who move to Vermont. According to an article from the Valley News, the state has set aside $500,000 for the program, and grants will be awarded on a first-come, first-served basis. They can be used to cover everything from relocation costs to computer hardware and software or broadband Internet service. Vermont has the nation’s third-highest median age, at 42.7 years, and its population is flat or slightly shrinking, according to U.S. Census Bureau figures cited by the Valley News article. By the end of 2018, the state had a database of about 3,000 people who were interested in the program, Vermont Department of Economic Development Commissioner Joan Goldstein said in a late-December article from Vermont Public Radio. To qualify for the grant, an applicant must be a full-time employee of a company with its primary place of business outside of Vermont, the state government statement said. Applicants must move to Vermont on or after January 1, 2019, and complete most of their duties remotely from a home office or coworking space in the state. More details about the program and the application process are available on the state’s Think Vermont website. If the Green Mountain State sounds like the perfect place for you to land for a while, check out this offer. 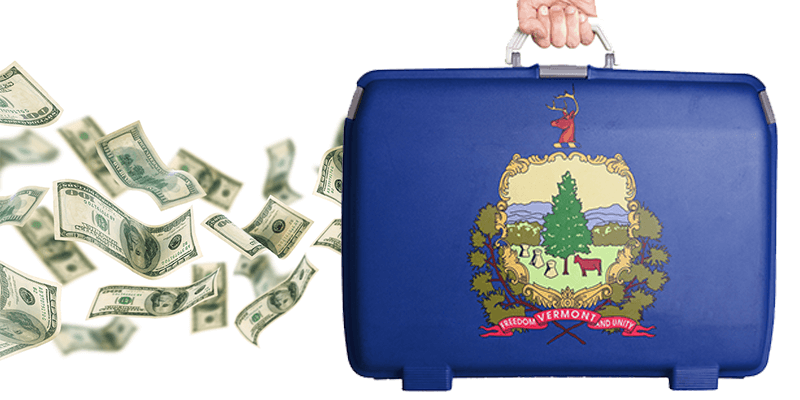 You could be a Vermonter before you know it, all while nabbing a little extra cash to cover work expenses.